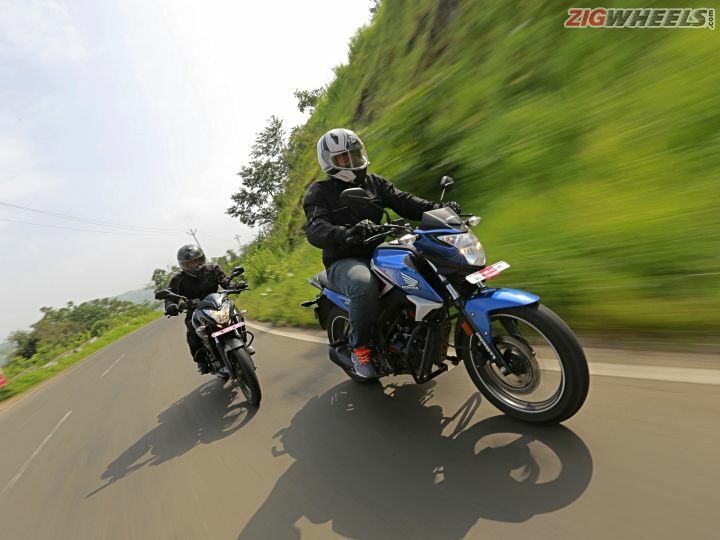 How does the newest entry to the 160cc segment stack up against the best selling 160 out there? The 160cc entry level sports is one of the most competitive segments in the bike spectrum, with manufacturers strutting their finest. Yet Honda has managed to hold top position with the CB Hornet 160R, overtaking the Yamaha FZ16 that kickstarted the segment many years back. Bajaj has been late to the 160cc party, but it came in guns blazing with the Pulsar NS 160, offering some best-in-class features and segment-firsts. It might look good on paper but is that enough to go up against the most established player in the segment? We put on a few hundred kilometres on both the bikes to find out. Neither bike looks strikingly new since the designs have been around for a while. The NS 160 carries the NS 200’s bodywork, which makes it a familiar and slightly dated face. The only perceptible visual difference is the ‘160’ sticker on the tank extensions, missing rear disc brake and skinnier tyres. It does come in an exclusive blue shade. The bike looks proportionate with sporty bits like the clip-on handlebars (segment-first) and split seats. but the thin tyres make it look more of a commuter than a bike with sporty intentions. The familiarity in design will also not sit well with NS 200 owners but sharing parts helps Bajaj keep the NS 160’s price low. Switchgear is better than the Hornet in terms of placement and feel. The switches are ergonomically placed and are smoother to the touch. The bike gets an analogue and digital instrument console that includes an analogue tachometer, digital speedometer, odometer, two trip meters and a clock. It misses out on a gear position indicator, which the Suzuki Gixxer comes with. The instrument console is easy to read in all conditions. The Hornet has a muscular, edgy design and looks fresh despite being a year old, thanks to the striking blue shade with new white and red graphic lines. The lines are surrounded by golden motifs, which we think intrudes into the clean design. The most striking design feature has to be the X-shaped tail lamp. Purely for looks, our vote goes to the Hornet. The Honda feels better put together than the NS 160. The panel gaps feature a tighter fit and overall quality is better than the NS 160. It loses points though on the cheap looking switches that seem to be lifted straight off a 110cc bike. It surprisingly misses out on an engine kill switch, a gross oversight on what is a premium bike. Its all digital instrument console also misses out on a shift light. The instrument console has large legible dials that are well laid out and easy to read. Both bikes have similar displacement engines but that’s where the similarities end. The Hornet’s 162.7cc air-cooled, long-stroke motor has a two-valve layout and is a tad reluctant to rev, but has ample low-rev torque. This is interesting because both motorcycles make roughly the same power and torque, at similar engine speeds. The Pulsar makes 15.5PS at 8500rpm compared to the Hornet’s 15.25PS at 8500rpm. Same is the case with torque figures: the Pulsar making 14.6Nm at 6500rpm compared to the Hornet’s 14.76 Nm at 6500rpm. The NS’s 160.3cc oil-cooled motor displays an opposite characteristic to the Hornet. The AS 150’s engine architecture has been used and stroke has been increased. It’s more rev-happy, being the only bike in the segment employing a four-valve configuration. Even so, it’s the Hornet that proved to be quicker in our performance tests. 0-60kmph took 5.08 seconds vs the NS 160’s 5.35, The Hornet was half a second quicker in the 0-100kmph sprint as well. We had trouble launching the Pulsar due to its revs dropping quickly, a trait seen on the NS 200 as well. The NS 160, even with the slower acceleration times, feels sportier. Free revving nature aside, unlike the Honda, it doesn’t resist when you push hard, with power delivery seeing a slight jump post 5500rpm and till 9000rpm. The Hornet’s torquey motor sees a performance surge earlier at 5000rpm but tapers off after 8000rpm. Also, it’s the Honda and not the Bajaj engine that sounds gruff! The NS 160’s gearbox feels the better of the two as well, in terms of shift quality and precision. The Hornet’s gearbox is notchy and encountered false neutrals, especially while downshifting from second to first gear. We also found the NS 160’s clutch action to be smoother and easier to modulate. Both bikes are easy to ride in the city but the NS 160 has the edge here due to its light front end, which makes it more manageable and requires less effort. The Pulsar betters the Hornet in roll-on times, managing 30-70kmph (3rd gear) in 5.61 seconds, over a second better than the Hornet. The 40-80kmph pull-up is a similar story, which proves that the Pulsar’s engine is more flexible than the Hornet. As a result, you do not have to worry about downshifting while overtaking or treading along in city traffic. You will be shifting more on the Hornet though, as the gearing is really tall. This, however, helps in improved fuel efficiency as the Hornet delivers 42.85kmpl in city and 52kmpl on the highway. Meanwhile, the NS 160 delivers 40.6kmpl in the city and 48kmpl in the highway. Both bikes have a 12-litre fuel tank, which should give the Hornet a range of 624 km and 576 km to the NS 160. The Pulsar NS 160 has a sportier riding position which has you lean a bit into the clip-ons. The footpegs are mildly rear-set and the narrow seat is set low, a boon for shorter riders. We, though, would have liked the footpegs to be set slightly lower as the current setup makes the rider’s lower body feel a bit cramped. The clip-ons are set sporty enough but do not compromise on ergonomics even for city riding. The seat cushioning is really good, firm enough to be comfortable over a 50-kilometre ride. The NS 160’s handling characteristics are similar to the NS 200 but with a lighter front end, it’s quicker to change directions and dive into corners. The front end feel is quite reactive and initially will have you end up dialling in more input than required. This can feel a bit disconcerting to novices though experienced riders are bound to relish this trait. The conventional front forks and rear gas-charged monoshock damper (segment-first) suspension setup is on the softer side but it soaks in mid-corner bumps and undulations well, while maintaining its line. A gas-charged shock absorber is more reactive and absorbs bumps quicker, cushioning the rider from bad surfaces even at slower speeds. The tyres are on the skinnier side but offer lots of grip and aid the agility of the bike. The Pulsar NS 160 is the only bike in the segment to feature a perimeter frame, borrowed from the NS 200. The perimeter frame imparts exceptional rigidity to the chassis but the flipside is added weight. The NS 160 weighs 4 kilos more than the Hornet 160 but feels like the lighter one of the two, and the one that’ll please seasoned riders better. For braking, the NS 160 has a 240mm disc upfront and a 130mm drum at the rear. To keep costs in check, Bajaj has skipped out using the Bybre front brakes from the NS 200, offering kit from Endurance instead. They offer a progressive feel but could do with more bite. They also seemed to fade a bit after a spot of hard riding. The Honda adopts a more commuter-ish riding position. The flat, one-piece handlebar, though, make the riding position vague. The handlebar is set at an awkward degree while the footpegs are set high and forward. The riding position brings forth nostalgia of riding your childhood tricycle. It is an awkward position that, coupled with a softly cushioned seat, makes long rides uncomfortable. The front suspension setup is softer and absorbs most road bumps and undulations you can throw at it without stepping out of line.The rear suspension is on the stiffer side and gets caught off by sharp bumps, transmitting them to the rider’s back. In terms of handling, the Hornet is more accommodating of novice riders. It uses a diamond-type frame with conventional forks upfront and a monoshock damper at the rear. While handling is not on the sporty side, what it offers is lots of grip from its fat 100-section front and 140-section rear tyre. The stable and grippy front end, though, is slow to react to directional inputs. There is lots of grip on offer though. You can simply pick up a line around a corner and the Hornet will go around it without drama. The Honda, though, does turn up the safety quotient with a sharper set of brakes. It gets a larger 276mm petal disc and a 130mm rear drum. It also gets the optional combi-brake system with a rear disc which should help new riders, who tend to use just the rear brakes, brake better. With the stock rear drum setup, 80-0kmph on the Hornet took 36.3 metres, compared to the Pulsar’s 39.54 metres. While the Hornet’s brakes could do with more feel, they offer a stronger bite and is the better one of the two. In terms of pricing, the Pulsar NS 160 undercuts the Hornet 160 by Rs 3,500. The Pulsar NS 160 is priced at Rs 78,368 (ex-Delhi) while the Hornet 160 retails for Rs 81,863 (Rs 86,313 for CBS-equipped version). Both motorcycles come with their own set of unique merits, catering to different rider sets. The Hornet is a safer bet. It makes sense for the newer rider who wants a sporty ride without the associated risks and without compromising on fuel efficiency. Contrarily, the NS offers a lot in terms of rider engagement. Its handling takes some getting used to but once past that, it is a hoot to ride. It is the more refined of the two and though it is slower in terms of acceleration, it is definitely the sportier of the two and our pick of the lot. Share your experiences with Pulsar NS160? Confused about Bajaj Pulsar NS 160?